Despite the reality of our times to sensationalize family entertainment in massive amounts of color and whimsy, some tiny part of us longs for the days of simpler values. They allowed us to get to the center of narrative philosophies, in which storytellers had something compelling to say, and pitched them home in the hearts of characters we found great commonality with. Those possibilities are at their most precious, I feel, in cartoons; made within the milieu of childhood considerations, they gave young adventurous eyes the chance to comprehend the imaginative depth of the world around them, how to deal with tragedy or danger, and what they could do to instill joy in themselves and others. It is, by all measures, the medium where experienced voices come alive and new ones can be made, usually without the unrelenting nihilism that is prevalent among the modern masses. Only recently did those ideas begin losing their shape in the rush of new technology; as computers improved the dexterity of the images, such yarns lost the nerve to get beneath the surface. The long term consequences are, unfortunately, running silent; as such endeavors continue to drive home box office business, movie studios are exacerbating a growing problem among young minds, which have been taught to be won over by pomp and circumstance instead of plots that might speak to their emotional development. 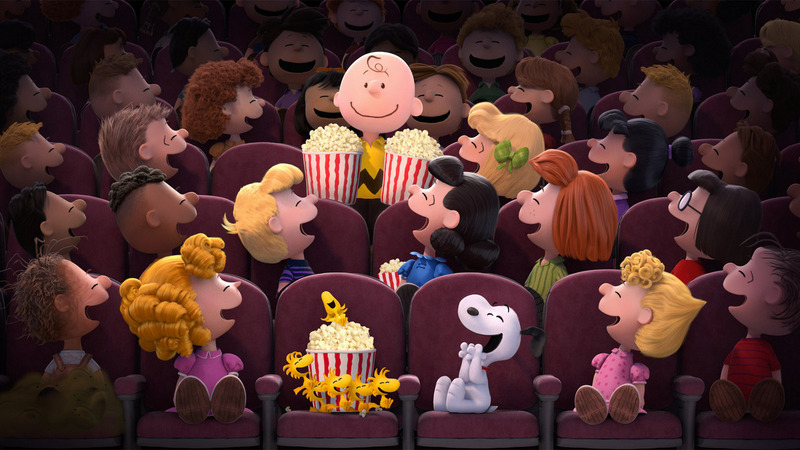 Every once in a while the past comes back to haunt us fondly, and “The Peanuts Movie” is, perhaps, the most enchanting of those more recent mainstream anomalies. The personalities that dominate the frames of Charles Schulz’s resonating comic strip have all but been absorbed into the timeless awareness of pop culture over the course of decades, and with good reason; collectively, they embody all of the fantasies and aspirations of young hearts, and give us stories that cater to the core desires of living in a world full of mischief and daydreaming. When I too was young, they were the sorts of characters that I visited just as frequently as those of, say, a movie like “The Goonies.” It’s fun to see something on screen that you can connect with like a distant friend, because those possibilities enhance the awareness of simple situations, and create personal stakes. A bunch of schoolkids playing a game of baseball is not inherently exciting, for instance, but when we attach our admiration to the ones pitching the curve balls, it’s hard not to become actively interested in specifics, however trivial. Something about those coarse, often hot-tempered cartoon children struck the precise chord. That has always been the strength of Schulz’ “Peanuts” premise, right down to the hundreds of comic strips to the variety of television specials that have been released over the years. This, the first of the theatrical translations, modernizes those sensibilities in the skin of an adventurous visual display, but does not involve them in a plot of excess or intensity. Much of it, in fact, is retread. The main story arc involves Charlie Brown, the most famous of cartoon underdogs, who is notable for, basically, being a nice guy with a lot of bad luck. Sometimes that comes down to a lack of personal perception, other times the influences of more scrupulous sorts who seek to play mean practical jokes on him. Towards the beginning of the picture, he awkwardness gets the best of him when he attempts to fly a kite in the thick of a snowstorm; others nearby, well-versed in the dimwitted antics of the simpleton before them, shrug it off as just another crazy day for clumsy little Charlie. But of course, to challenge that perception, he needs a catalyst, and in this movie it comes in the form of a mysterious red-headed girl, who has just moved into the house directly across from him and encourages smitten feelings. Those thoughts, of course, must be the conduit in which he must face paralyzing social fears and self-confidence, lest he lose the chance to make friends with the pretty new girl in town. 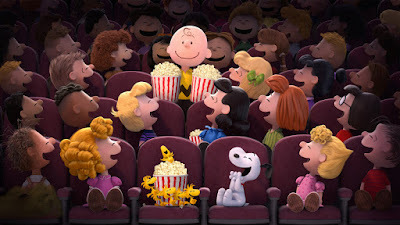 The screenplay devises countless scenarios that all must play right into the framework of the traditional “Peanuts” themes, which is to show young characters being true to their nature while exchanging mischief, snappy put-downs, celebratory observations and even petty jealousies. At the center of them is one loner who must consider those all outside of the alienating context of immaturity, and off in the peripheral are the bizarre antics of his dog Snoopy, who must supply his own brand of bizarre comic relief in order to balance out the more meaningful messages of the lead (the subplot itself, involving the writing of a story about the chase of a renegade airplane, offers some amusing distractions). While not much of the formula deviates from the intention – and certainly many of the plot points are recycled exercises – we don’t mind all that much. Lesser examples would flounder by playing it safe, but this premise has a core of personalities that give joy to the most mundane of plot measures. There are no grandiose twists, no possibilities of elaborate narrative excursions, but in the presence of those we deem cheerfully familiar, we take delight in nearly every conventional detail. There is a little Charlie Brown in all of us. His failures are evenly matched by social awkwardness, sure, but something profound exists underneath those quirks: namely, a demeanor that is all-appreciating, kind, gentle, and driven by the unfiltered desire to, you know, do the right thing. There is a moment in the film when he hopes to impress the red-headed girl by showing off a magic act at the school talent show, but alters the plan when his sister, the naïve Sally, endures the humiliation of her peers in a preceding act. To save her sense of self-esteem, he interjects in order to turn the act around in her favor, an impulse of noble intentions that he doesn’t immediately see. It escapes my knowledge if that specific situation were ever in any of the original material that Schulz himself wrote, but either way the details are faithful to his overreaching sensibilities. The movie was written by his own sons, and obviously so; they channel the context from succinct suggestions, not the sensation of current studio ambitions. The look has evolved, but everything that is happening in the lives of these young personalities is in synch with the intentions of their creator, and he would likely find that prospect just as noble as it is faithful. So much could have gone wrong in updating this formula. There are countless temptations among film artists to always compete against one another in showing off something that has never been seen before, or creating images that stretch the scope of imaginative impulses. “The Peanuts Movie” certainly contains traces of that thought process. It isn’t traditional by any stretch of imagination; the distinct style remains intact, but the canvas is much more interactive, almost challenging in the way it seems to merge the hand-drawn sensibilities with the layered prowess of computer images. It pops in ways that I haven’t seen before. But by marrying that technical update to a script that sees all its players engaging in the same routines that we have come to anticipate, the filmmakers aren’t so much reinventing the concept as they are liberating it from dated artistic charms. This is a small, sweet and charming film that celebrates the heritage of Schulz’s world, and does so by simply reminding us that we, too, once came from the same core as a bunch of schoolkids seeking fun in between fiery interactions.